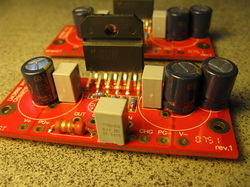 LM3886 based amplifiers are very popular in the DIY audio world. They offer excellent sound quality, require minimal amount of components (easy to build), and provide just right amount of power for average speaker. I have build my amp using dual mono kit from chipamp.com, highly recommended. What is dual mono? It's two mono amplifiers in one chassis, where each amplifier has own power supply. Is it better than stereo? Depends on one's personal preference and application. The LM3886 is a high-performance audio power amplifier capable of delivering 68W of continuous average power to a 4 load and 38W into 8 with 0.1% THD+N from 20Hz-20kHz. The LM3886 maintains an excellent signal-to-noise ratio of greater than 92dB with a typical low noise floor of 2.0µV. It exhibits extremely low THD+N values of 0.03% at the rated output into the rated load over the audio spectrum. It's completely safeguarded at the output against overvoltage, undervoltage, overloads, including shorts to the supplies, thermal runaway, and instantaneous temperature peaks. As mentioned above, the LM3886 dual mono was built from the standard non-inverting dual mono kit from chipamp.com. Each mono module is powered by 200 VA toroidal transformer with dual 22V secondaries (Antek AN-2222). Each transformer has own 2A slow blow fuse and 5A current limiter. Since this amplifier will be used in active setup, along with Pass Labs DIY F5, it was build to mach it in style. Heat-sinks are located inside the chassis, with plenty of holes drilled for sufficient ventilation. It is used to power two dual 8" subwoofers, and it powers them very well. When compared against F5, it sounds fuller, but not as clean and detailed. LM3886 provides excellent sound quality at low cost.